Today at NYCC, the cast and crew of the newest X-Men movie, Dark Phoenix, gathered together on SYFY WIRE’s Live Stage to tell us what they could about the second big-screen adaptation of Jean Grey's infamous story arc. "We reset the timeline, partly in order to be able to tell the Dark Phoenix story again," said director Simon Kinberg, who's been involved with the X-Men franchise since 2006's X-Men: The Last Stand, which he co-wrote with Zak Penn. "We didn't feel like we did it total justice in X-Men 3." After X-Men: Days of Future Past wiped the continuity clean, Sophie Turner reprises her role as Jean Grey from X-Men: Apocalypse, and said that her second time as the super-powered telepath was a much more difficult role. "It's a really emotionally taxing movie," explained Turner. "Every scene was like 'We're gonna do a really intense scene tomorrow,' then Simon's like 'Okay, great! Now you have a really intense scene on Friday, Saturday, Sunday, Monday, Tuesday, Wednesday...'"
Still, Turner said that the emotional toll was necessary to portray this particular iteration of Jean Grey. "You see her very, very conflicted. She goes through waves of emotion, she goes through this continuing theme of abandonment, and it comes out in ways she wished it didn't." It's that "wished it didn't" line that had audiences intrigued as to what exactly this could be referring to. 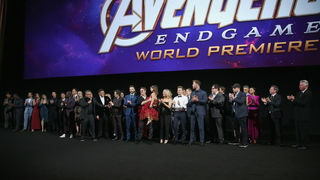 While no one gave away any specifics, Kinberg did refer to a funeral scene that pops up briefly in the film's trailer, which comes at a pivotal point in the story. "Sophie's character goes full Phoenix," Kinberg began. "[She's] destructive and lethal in this film, and kills and really hurts a lot of people. One of those people is in that grave in that scene." Despite the emotional weight of the story, there was one thing Kinberg insisted on including, which was that the X-Men would be sporting the classic blue-and-yellow costumes. "This is the first time I got to direct one of these movies," said Kinberg. "I might not get another chance, so I really wanted to finally see those costumes on screen." Dark Phoenix will storm into theaters on June 7, 2019. In the meantime, be sure to check out SYFY WIRE’s full coverage of NYCC 2018, including up-to-the-minute news, exclusive interviews, and videos.